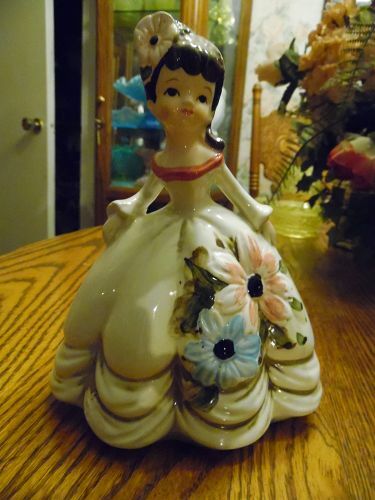 Vintage Lefton " Southern Bell" ceramic figurine no. 6093. 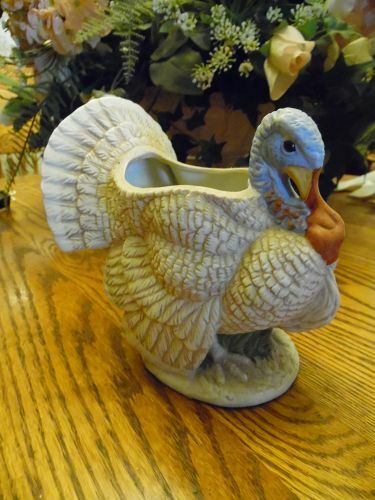 Figurine measures 7 1/4" high, 5 1/2" base. Figurine has Pink and Blue flowers. 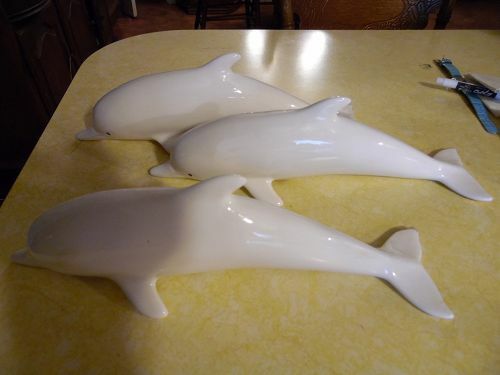 1970's Condition is very good no chips or damage. Fenton L.G. 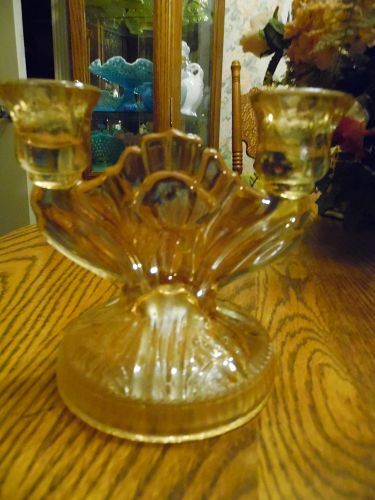 Wright vintage yellow vaseline glass covered bell butter dish in the Daisy & Button design. 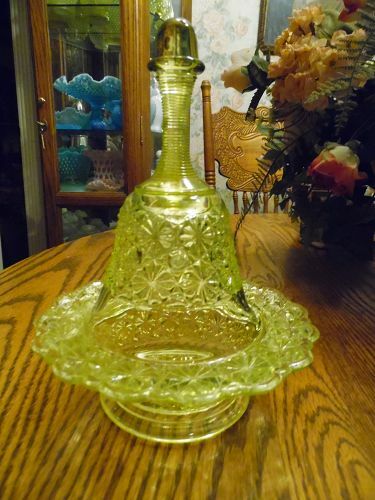 It glows beautifully green under a black light, The dish measures 6 1/2" x 2" high, the bell cover is 6 1/2" tall x 4 1/8" across the bottom, total height is 8 3/4" tall. There is a clapper in the bell also. 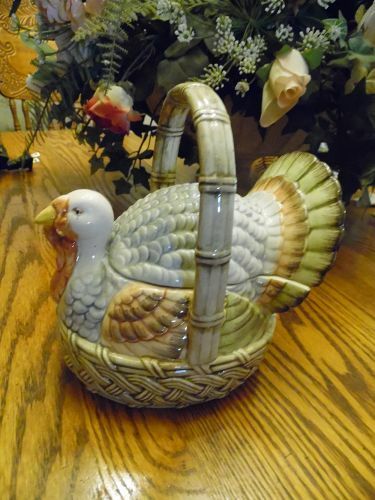 This piece is in excellent condition, no damage. 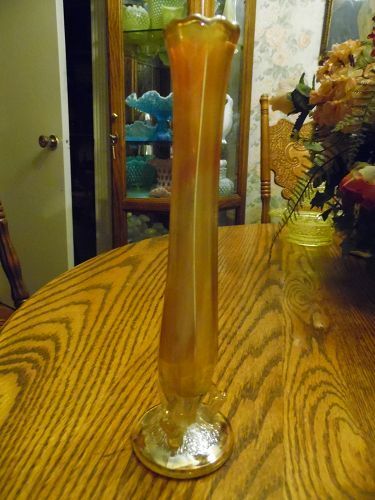 Dugan / Diamond glass vintage Carnival Glass bud vase. Measures approx. 2 1/4" wide at the base by 9" tall. Pretty excellent. No chips cracks repairs fleabites etc. May or may not have have normal straw marks, bubbles, Manufacturing blems etc. Imperial Rose pattern. 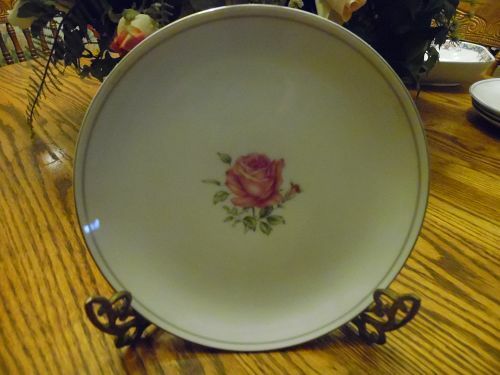 Fine China of Japan, This is the salad plate. 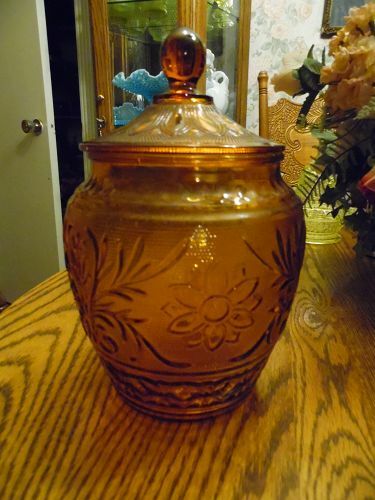 Measures 7 7/8" diameter and is in excellent condition with no cracks, chips or wear. Silver/platinum trim is shiny bright. There are 4 available. 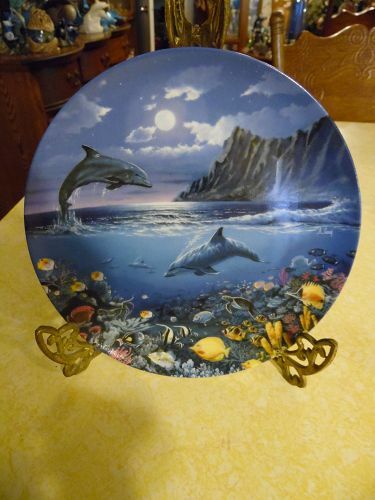 Price is for each plate .Other items listed in this pattern. See catalog. Imperial Rose pattern. 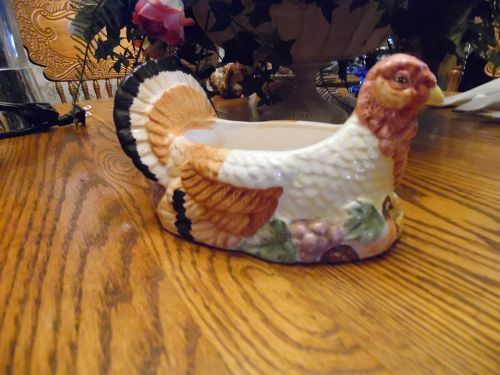 Fine China of Japan, This is a relish dish or the underplate for the gravy boat. 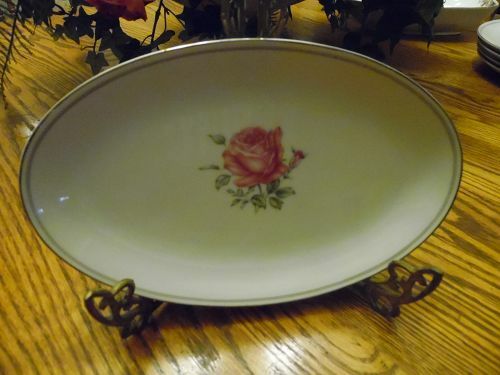 Measures 9 1/4" x 5 3/4" and is in excellent condition with no cracks, chips or wear. Silver/platinum trim is shiny bright. 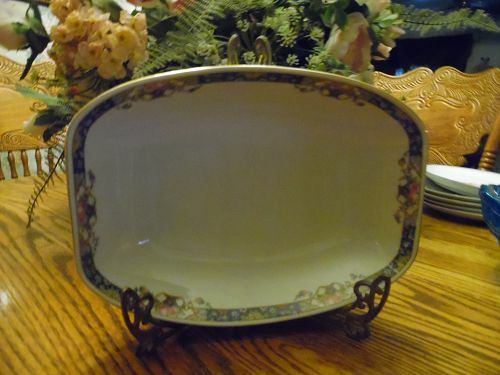 Beautiful Edelstein Bavaria china rectangulaer shaped vegetable bowl encircled with flower baskets and colorful flowered blue band on a white colored background with rich gold trim. It measures 2" tall x 9 3/4" in length x 6 7/8" in width. Marked, Edelstein, Bavaria, 1355. Excellent condition with no chips cracks or wear. Gold is shiny bright. 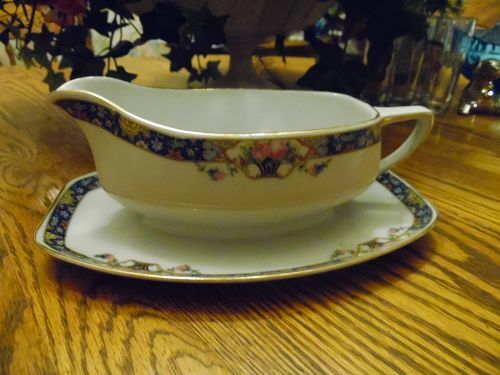 Beautiful Edelstein Bavaria china handled gravy boat with attached rectangulaer shaped underplate encircled with flower baskets and colorful flowered blue band on a white colored background with rich gold trim. It measures 3 3/8" tall x 9" in length x 6 1/4" in width. Marked, Edelstein, Bavaria, 1355. Excellent condition with no chips, cracks or breaks. 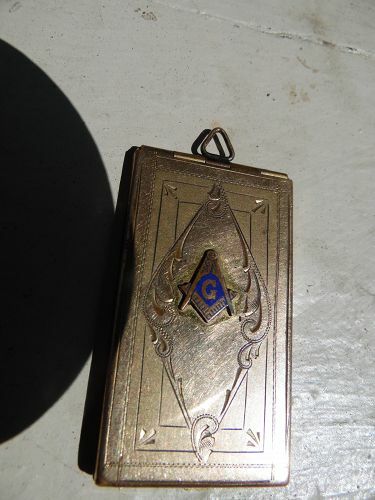 Gold is bright with no wear. Discontinued pattern. 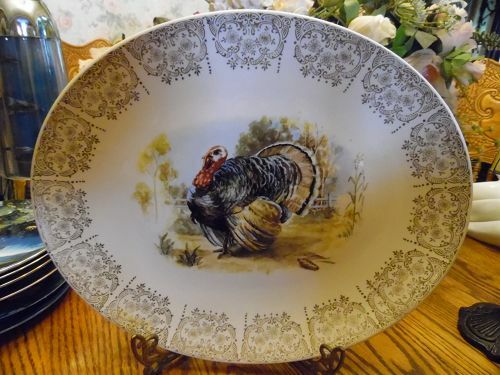 Vintage Knowles platter with turkey center filigree edge 15"
Large 15" platter with turkey center and gold filigree edge. 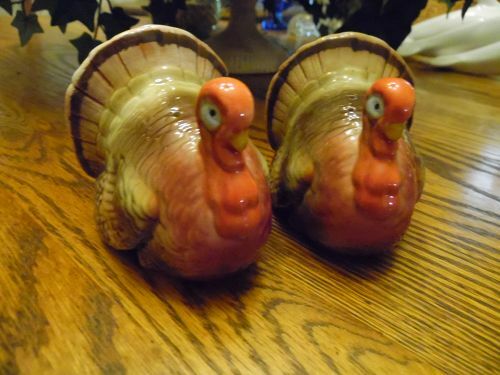 Made by Knowles but is not marked. Perfect condition with no chips cracks, crazing, or wear. 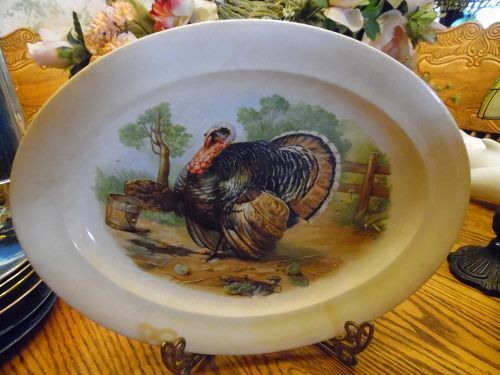 Actual measurements oval 14 3/4" x 12", A great addition for Thanksgiving.